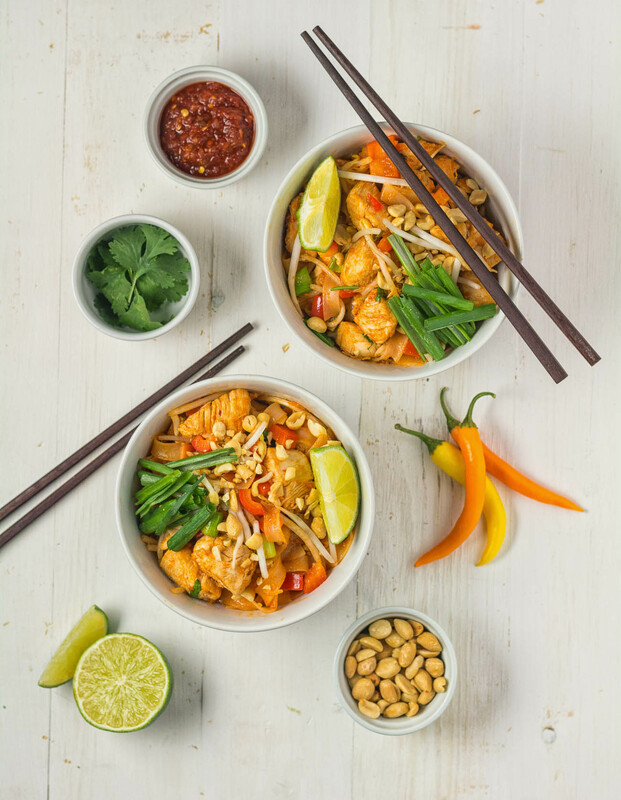 Pad Thai is a classic noodle stir fry that pretty much everybody loves. And there’s no reason you can’t make it like you get at your local restaurant at home. I love pad Thai. One of my favourite noodle dishes. You can make it as hard or as easy as you want. This is a weeknight version. Easy. Fast. Perfect for everyone. There was a time before Internet. Hard to believe but true. Back then, you had to figure things out the hard way. PBS. Cookbooks. Word of mouth. All still great but more work. I learned how to cook it in the only cooking class I ever took. Taught by a Thai who I would credit except I have no idea what her name was. This recipe has drifted a bit over the years but still have my original notes so I know it’s really her recipe with some of my technique on top. This isn’t Alton Brown’s pad thai. 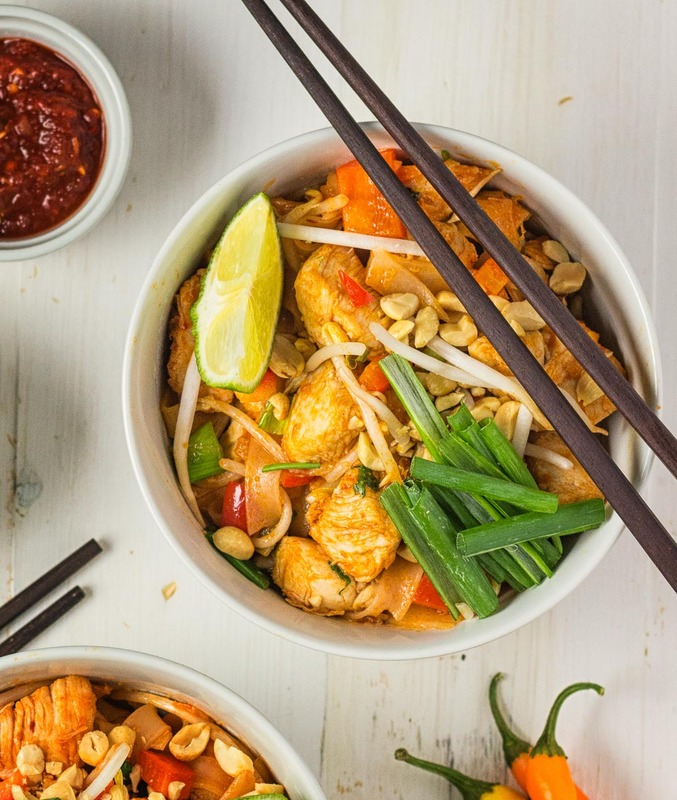 This is pad thai for the rest of us. No dried shrimp, no salted cabbage, no palm sugar and no marinated tofu. His is probably better but you can make this one without a trip to an asian market. There are only three ingredients you don’t already have. You can use srirachi instead of sambal oelek. White vinegar can stand in for concentrated tamarind. Fish sauce though. There is no substitute. Soy sauce is not a substitute. Soy sauce will destroy this dish. Luckily, you can find fish sauce at a big grocery store. It’s not exotic any more. Soak your noodles in lukewarm water. This is critical. Critical. Soaking in boiling water equals mush. Boiling equals mush. Mush equals terrible pad thai. Simple as that. Soak in warm water for 30-45 minutes. Just do it. You will be bitterly disappointed if you don’t. Modify to taste. Add shrimp, tofu or scramble an egg. Leave out the chicken. Serve with lime wedges, chopped peanuts, cilantro and sambal oelek on the side and let everyone customize to taste. This is pad Thai for Tuesday night. Easy. For everyone. Any day. Every day. 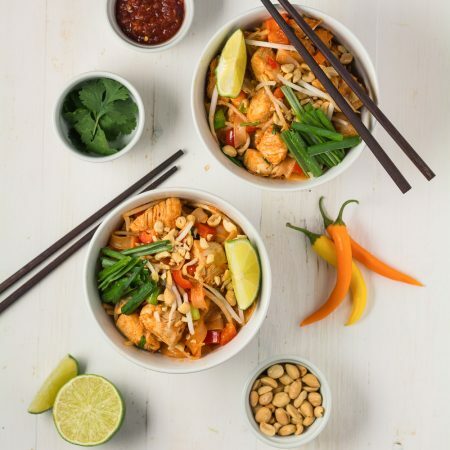 This is a simple straight forward pad thai using easy to get ingredients. Do your prep before you start cooking. This dish comes together in under 10 minutes. 2 Tbsp peanuts chopped plus more to serve. Soak the rice noodles in lukewarm water for 30-45 minutes. They will turn white but still be quite firm. Prep all your ingredients. Chop your vegetables. Cut the chicken into 3/4 inch cubes. Combine the fish sauce, brown sugar, tamarind concentrate, tomato paste and sambal oelek in a small bowl. This is your liquid mixture. Heat a well seasoned wok or large non-stick frying pan. Add the oil. When the oil starts to shimmer, add the chicken and cook until chicken is just done - about 3-5 minutes. Add garlic and cook, stirring, for another 30 seconds. Mix in the noodles. Stir to coat the noodles with oil. Cook about 30 seconds, stirring constantly. Be careful not to break the noodle strands. Add the liquid mixture and stir. Remove from heat. Mix in the red pepper, green onions, cilantro and bean sprouts. Serve, topped with chopped peanuts. Pass the lime wedges, sambal oelek, cilantro and chopped peanuts to allow people to tweak to their individual tastes. You can replace the chicken with shrimp. Just make sure you don't overcook the shrimp. You can also replace the chicken with tofu or use a mix of any of the three. In main course, noodles, poultry, seafood, thai. Bookmark the permalink.